Gabriel was a limited participant during Wednesday's practice due to a knee injury. Gabriel caught four passes for 52 yards in Sunday's 24-10 victory over the Jets. 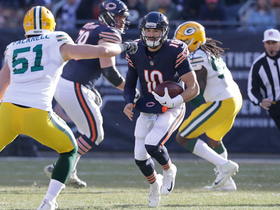 Analysis: With Chicago controlling this game throughout, the Bears attempted just 29 passes, which limited Gabriel's opportunities, and although one of his six targets was a deep shot down the right sideline, the pass was significantly overthrown. He's only found the end zone in one game this season, and his inconsistent yardage totals make him a volatile fantasy option. 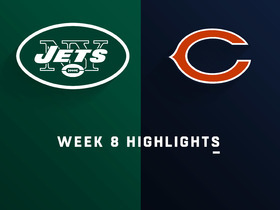 Gabriel could act as the Bears' top receiver in Sunday's game against the Jets with Allen Robinson (groin) inactive. Gabriel caught three passes for 26 yards in the Bears' 38-31 loss to New England. Gabriel caught all five of his targets for 110 yards and added a nine-yard carry in Sunday's 31-28 overtime loss to the Dolphins. 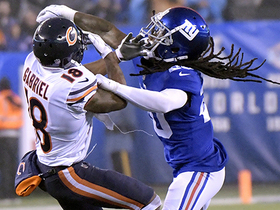 Analysis: Gabriel is emerging as a legitimate big-play threat for the Bears, as evidenced by the 47-yard deep ball he hauled in during the first half and his 54-yard catch in the third quarter. 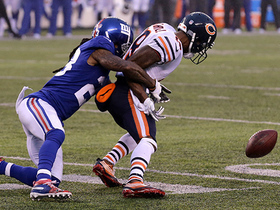 Owners in deeper formats should take notice ahead of Chicago's Week 7 clash with New England. Gabriel brought in all seven targets for 104 yards and two touchdowns in the Bears' 48-10 win over the Buccaneers on Sunday. He also rushed once for 10 yards. 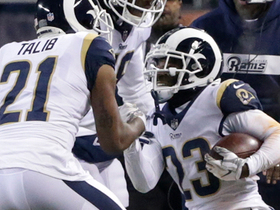 Analysis: Like teammate Tarik Cohen, Gabriel finally had a chance to showcase some of his game-breaking ability in the blowout win. 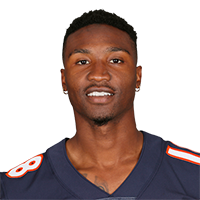 The fifth-year speedster notched his first two touchdowns as a Bear in the process, posting a pair of three-yard scores in the second and third quarter. Gabriel will look to build on Sunday's breakout effort against the Dolphins in Week 6 following a Week 5 bye. Gabriel caught six passes for 34 yards in the Bears' 16-14 victory over the Cardinals in Week 3. Analysis: Although Gabriel failed to average six yards per reception, he was targeted twice on deep passes, but both of those attempts were broken up. In addition, he was targeted a team-high 10 times, and he's averaging six touches per game through three contests. Even though he's yet to post more than 47 yards in a game, his usage is promising, and if the Bears offense can begin to gel, he could see an increase in his fantasy value. Gabriel caught four passes for 30 yards while adding another 17 yards on three rushing attempts in Monday's win over the Seahawks. Gabriel played 60 of 70 offensive snaps (85.7 percent) in Sunday's 24-23 loss to Green Bay, catching each of his five targets for a total of 25 yards. 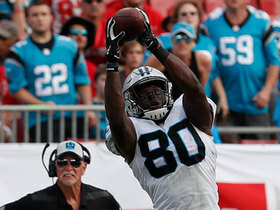 Gabriel (foot) caught his only target for a 10-yard reception during Saturday's preseason game against the Chiefs. Analysis: It was originally thought that Gabriel wouldn't return until the regular season began, but the speedy wideout progressed quickly through his rehab process. The coaching staff clearly wasn't ready to push it, limiting Gabriel to just a few snaps before he called it a day. Regardless of his impact on the game, Gabriel's availability bodes well for the offense with the regular season drawing near, as his ability to stretch opposing defenses can open things up for his teammates. Head coach Matt Nagy reported that he's very confident that Gabriel (foot) will be ready for Week 1, Larry Mayer of the Bears' official site reports. Analysis: It certainly would help the entire Bears offense if Gabriel could return to face Green Bay, as he possesses the deep speed to take the top off defenses, which potentially will create more space for his teammates. In terms of his fantasy value, his big-play ability gives him weekly upside, but he's never been a high-volume target, which also gives him a low weekly floor. Gabriel (foot) isn't expected to play Saturday at Denver, Rich Campbell of the Chicago Tribune reports. Analysis: Gabriel is approaching the two-week mark in his recovery from a foot injury, which is conspiring to hold him out of preseason action. During pregame warmups, he was among a handful of Bears not in uniform, a sign that he won't take the field Saturday. Considering he signed a four-year, $26 million contract in the offseason, Gabriel is in the Bears' 2018 plans, but his initial in-game snaps with the team will have to wait another week. Gabriel (foot) will not dress for Thursday's preseason game against the Bengals, Rich Campbell of the Chicago Tribune reports. Bears coach Matt Nagy said Gabriel's foot injury isn't serious, Rich Campbell of the Chicago Tribune reports. Gabriel did not practice Sunday due to a foot injury and is considered day-to-day, Kevin Fishbain of The Athletic Chicago reports. Analysis: It's unclear exactly when Gabriel suffered the foot injury, but given that he is being viewed as day-to-day, it doesn't appear the wideout will be sidelined for too long. Gabriel has impressed during the start of training camp and is expected to play an important role this season as part of a revamped receiving unit in Chicago. 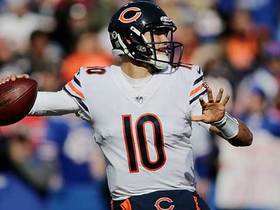 Gabriel is off to a good start early in training camp and is excited for how the Bears plan to use him, Patrick Finley of The Chicago Sun-Times reports. "[Gabriel]'s working through some adjustments within the play on what he does against a certain coverage," said Bears coach Matt Nagy. "But the biggest thing for him is he's a speedy guy, and he knows how we're going to use him and some of the things we want to do. And he's done a great job." Bears head coach Matt Nagy expects Gabriel to stretch the defense vertically in 2018, Adam Jahns of the Chicago Sun-TImes reports. Analysis: Nagy plans to use Gabriel in a "zebra" role, which is primarily designed for a slot receiver that can also be put in motion to create mismatches. Gabriel has had two seasons with at least 16.5 yards per reception during his four years in the league, though he has yet to catch more than 36 passes in any campaign. Although he's unlikely to draw considerable target volume from game to game, Gabriel's big-play ability makes him an upside play in the latter rounds of fantasy drafts. Gabriel is in line to sign with the Bears, Brad Biggs of the Chicago Tribune reports. Gabriel sent out a tweet suggesting he won't be back with the Falcons. Gabriel caught two balls for four yards Saturday as the Falcons fell, 15-10, to the Eagles in the divisional round. Analysis: Gabriel finishes the season with 33 receptions for 378 yards and one touchdown, and while that only represented two fewer catches than last season, he recorded 201 fewer yards and five fewer touchdowns than in 2016. He'll be an unrestricted free agent this offseason, and it's certainly possible he'll look to latch on with a team that isn't as stacked as the Falcons at wide receiver. Gabriel (hamstring) practiced fully Thursday and is "ready to go" for Saturday's wild-card game against the Rams, Vaughn McClure of ESPN.com reports. Analysis: Aside from his early departure Week 17, Gabriel hovered between 40 and 65 percent of the offensive snaps in most games during the 2017 campaign. Because he played third fiddle to Julio Jones (ankle/ribs) and Mohamed Sanu throughout, Gabriel managed multiple catches in 10 of 16 games this season. 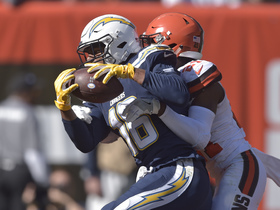 Of those six with one or fewer, though, four of them occurred during the final five contests, meaning he may have a difficult time getting in on the act against the Rams' 13th-ranked pass defense. Gabriel (hamstring) was a limited practice participant Tuesday, Kelsey Conway of the Falcons' official site reports. Analysis: In the portion of practice open to the media, Gabriel was seen working on the side, per Vaughn McClure of ESPN.com. Typically, such activity doesn't translate to a limited showing, so Gabriel likely took part in individual drills, at the very least, Tuesday. The development is a positive one after he left Sunday's Week 17 outing versus the Panthers due to a hamstring injury. Gabriel is questionable to return to Sunday's game against the Panthers with a hamstring injury, Vaughn McClure of ESPN.com reports. Analysis: Gabriel sustained the injury in the latter stages of the first quarter as he pulled up and reached for his hamstring while covering a punt. Justin Hardy and Andre Roberts are options to step in as the Falcons' No. 3 receiver while Gabriel is sidelined. Gabriel caught two passes for 16 yards in Monday's 24-21 win over the Buccaneers. Analysis: Coming off a 2016 campaign when he scored six touchdowns, Gabriel has been a bit of a disappointment in 2017, as he's only scored one touchdown on the year. He was held to one catch for 10 yards the last time the Falcons played the Saints, and the two teams will meet again in Week 16. Gabriel caught his only target for 10 yards and added nine yards on a carry during Thursday's 20-17 win over Atlanta. Analysis: The playmaker has had a weak encore campaign in Atlanta's offense. Gabriel looked to be righting the ship during Weeks 9 and 10 with 132 total yards, but he has just nine touches and 53 total yards in the four weeks since. He saw a solid 31 offensive snaps on Thursday, but Atlanta offensive coordinator Steve Sarkisian hasn't utilized him as often or in the same way Kyle Shanahan did in 2016. 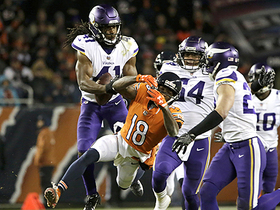 Gabriel caught one of two targets for six yards during Sunday's 14-9 loss to the Vikings. Analysis: Gabriel has averaged just 2.4 targets in the past seven games after seeing 5.2 targets per game through the first five weeks of the season. For someone who relies upon a long touchdown to be of any service in fantasy, this decreased workload is bad news. With that said, the Falcons impending date with the Saints on Thursday could turn into a high-scoring affair, and Atlanta may need their downfield threat to keep pace. Gabriel caught all three of his targets for 16 yards during Sunday's 34-20 win over Tampa Bay. Gabriel brought in three of four targets for 56 yards in Sunday's 20-17 loss to the Panthers. Gabriel (tooth) was a full practice participant Thursday, Vaughn McClure of ESPN.com reports. Analysis: Gabriel's practice reps were impacted by a pulled tooth Wednesday, but its importance was downplayed after completing Thursday's session. Once Sunday's game in Carolina arrives, expect Gabriel to vie with tight end Austin Hooper for the attention of Matt Ryan behind the Falcons' top two pass catchers Julio Jones and Mohamed Sanu. Gabriel (tooth) was limited at Wednesday's practice, Kelsey Conway of the Falcons' official site reports. Analysis: Per ESPN.com's Vaughn McClure, Gabriel wore a black no-contact jersey at Wednesday's practice. The wideout probably had some kind of dental procedure earlier in the week, and it would be a surprise if the issue threatens his availability for Sunday's game against the Panthers. Falcons coach Dan Quinn may provide more information Wednesday or Thursday when he talks to the media.